The Miami Hurricanes may not be playing for the BCS national title or in a New Year’s Six bowl game, but the team is bowl eligible for the fourth straight season. 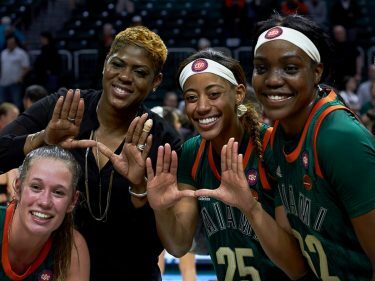 By staying undefeated in the month of November, the Canes have put themselves in prime position for a Tier I bowl game; therefore, Miami will not be featured in the Military, Quick Lane, Independence, St. Petersburg or Birmingham Bowls. Miami (8-4, 5-3 ACC) has not won a bowl game since the MPC Computers (now Famous Idaho Potato) Bowl in 2006, when it edged the Nevada Wolf Pack, 21-20. 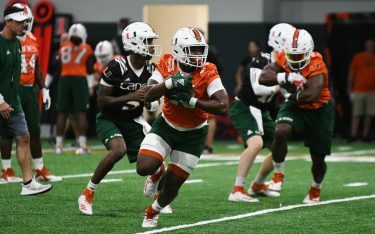 Since 2013, the Hurricanes have appeared in the Russell Athletic Bowl against Louisville, the Independence Bowl against South Carolina and the Sun Bowl against Washington State. “It will be fun to not be in Shreveport,” said junior tight end David Njoku, who was reminiscing the 2014 Independence Bowl, after the win against Duke. Projected by Mark Schlabach of ESPN.com, CollegeFootballNews.com and SBNation.com. The TaxSlayer Bowl is likely to favor the ACC over the Big Ten this season, despite inviting Iowa and Penn State the past two years. Before the Miami/FSU rivalry, there was the highly anticipated Miami/Florida rivalry. A matchup against the Gators would be the first since 2013 for the Canes. That season, Miami upset No. 12 Florida in what was then Sun Life Stadium, 21-16. The Hurricanes are 2-0 against the Gators in postseason play, the most recent bowl victory coming in Atlanta in the 2004 Chick-fil-A Peach Bowl. A win over the SEC East champs would be a tremendous boost heading into the offseason and a great, yet very early, preview of the 2019 season opener. A bowl matchup with Georgia would feature Mark Richt going against his former employer and many of the guys he recruited, including quarterback Jacob Eason and running back Nick Chubb. Richt would have the opportunity to silence Dawg Nation’s harsh criticisms of his leadership once and for all. Arkansas is an SEC West team looking to make its first bowl appearance since its win over the Texas Longhorns in the 2014 Texas Bowl. The SEC West division member features running back Rawleigh Williams, who has more than 1,000 rushing yards this season. Projected by NBC Sports, The Macon Telegraph and Jerry Palm of CBS Sports. Mark Richt’s last postseason win came from this bowl in 2014, when he and the Georgia Bulldogs defeated the Louisville Cardinals, 37-14. The last time South Carolina finished 6-6 was in 2014, before defeating Miami in the Independence Bowl. The Gamecocks are in a much better position than its 3-9 season last year and could possibly be in a Tier I bowl. The team upset No. 18 Tennessee but lost in a blowout to No. 4 Clemson to finish the average regular season. Like the Canes, the Gamecocks have a new head coach: former Florida head coach, Will Muschamp. Tennessee was an early pick for the SEC East and even had a chance to go to its conference championship game if No. 23 Florida had lost to No. 16 LSU on Nov. 19. After starting 5-0 with close wins against Appalachian State and Georgia, and beating Virginia Tech in front of a sold-out crowd at Bristol Motor Speedway, the Volunteers faded out of the top-25 rankings with losses to Texas A&M, No. 1 Alabama and South Carolina. The team was ranked again after defeating Kentucky, but faltered recently against Vanderbilt. Josh Dobbs is a talented quarterback, but Brad Kaaya and his receiving arsenal can take advantage of the Vols defense. Projected by Brett McMurphy of ESPN.com. This matchup would feature a large Canes fan base from the New York and New Jersey areas. The Minnesota Golden Gophers have quietly posted an 8-4 record, only suffering losses to Iowa, No. 19 Nebraska and conference championship contenders Penn State and No. 6 Wisconsin. After facing a tough schedule this season, Minnesota could prove to be a challenge for Miami. Projected by Stewart Mandel of Fox Sports. The Canes could make its second bowl trip to Orlando in four years to face the Mountaineers. West Virginia has yet to finish its season; its last home game of the season is against Baylor, which gives Miami fans a taste of what to expect should this projection be a reality. West Virginia is one of the top teams in the Big 12; its sole losses coming to Oklahoma State and No. 9 Oklahoma. Its defense features Rasul Douglas, who has eight interceptions this season. Should Miami return to this bowl for a second-straight year, it would face the Stanford Cardinal. The Cardinal did not have the same type of successful season it had last year, which featured a Rose Bowl win over Iowa. However, despite suffering losses to No. 10 Washington, Washington State and Colorado, Stanford finished undefeated thereafter, posting a 9-3 record. Its roster includes 2015 Heisman finalist Christian McCaffrey. The running back has more than 1,900 all-purpose yards this season. The matchup here depends on whether the Orange Bowl takes a Big Ten team over an SEC team. If it does, the Citrus Bowl will take an ACC team. This bowl takes the second, third or fourth-best ACC team. Because Miami is currently ranked No. 6 in the conference, it is unlikely that the team plays here.